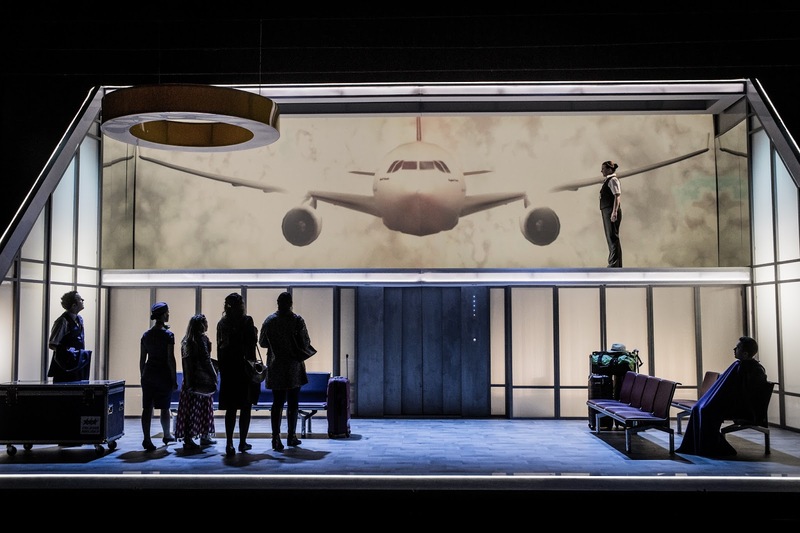 The Royal Academy of Music's fine new theatre reopened with a production of Jonathan Dove's Flight directed by Martin Duncan. We caught the final performance on 17 March 2018 with the second of the two casts, Aoife O'Connell as the Controller, Alexander Simpson as the Refugee, Alexandra Oomens and Alexander Aldren as Tina and Bill, Flora MacDonald and Robert Garland as the Stewardess and the Steward, Frances Gregory and Paul Grant as Minskwoman and Minskman, Leila Zanette as the Older Woman and Darwin Prakash as the Immigration Officer. Designs were by Francis O'Connor with lighting by Jake Wiltshire, projections by Ruben Plaza Garcia and movement by Mandy Demetriou. Jonathan Dove's 1998 opera Flight with a libretto by April de Angelis, commissioned by Glyndebourne Opera, remains one of Dove's most popular stage works. It is a very traditionally constructed piece, April de Angelis's witty libretto provides a closed room scenario and opportunities for each of the characters to reveal themselves to us. Part of the work's success is the way it combines humour with poignancy, the work is constantly balanced between the two. At Opera Holland Park in 2015 with a cast varying from young artists to highly experienced, Stephen Barlow's production provided a poignant experience [see my review]. With a lively young cast, it was no surprise that Martin Duncan's production prized humour above all, so that Alexandra Oomens and Alexander Aldren played Tina and Bill's relationship problems very much as comedy, and playing a role some 30 years older than her Leila Zanette's Older Woman was funny in her self-delusion about her holiday romance though we always laughed with her rather than at her. Some characters are deliberately funny, and Flora MacDonald and Robert Garland had great fun as the Stewardess and Steward, archetypes perhaps but very funny ones. And there was poignant seriousness too, Alexander Simpson was beautifully touching as the Refugee, convinced that his brother refugee might still be coming and Simpson really made the Refugee's solo of explanation count. Similarly, the couple going to Minsk, Frances Gregory and Paul Grant, really made us care for them, and I was particularly taken with Gregory's powerful, almost intense performance. Darwin Prakash made a strong Immigration Officer. The controller stands above them all, both physically and vocally (the role is a high coloratura). 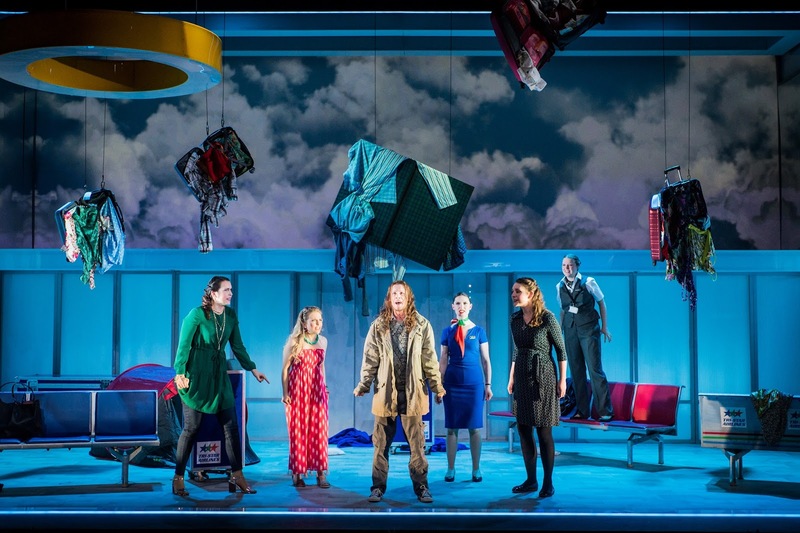 Aoife O'Connell took over the role at short notice and was impressive in the role, and I rather liked the way that she made the character quite deep and not quite nice, there was an edginess to her relationship with the Refugee. The production was very much an ensemble one, characters moved in and out of focus and often there were ensemble scenes with stylised movement. There was an essential naturalism to the performances, but often in a stylised context which emphasised the humour. Francis O'Connor's fixed set was enlivened by video projections above, whether they be electrical storms or landing planes. And sometimes things did come out the skies, a host of open suitcases at one point with one doing duty for Minskwoman's touching aria and another hiding the Steward and Bill during their tryst. And when the plane lands, a giant aeroplane wheel descends, to then forme the backdrop for the Refugee's moving narrative. 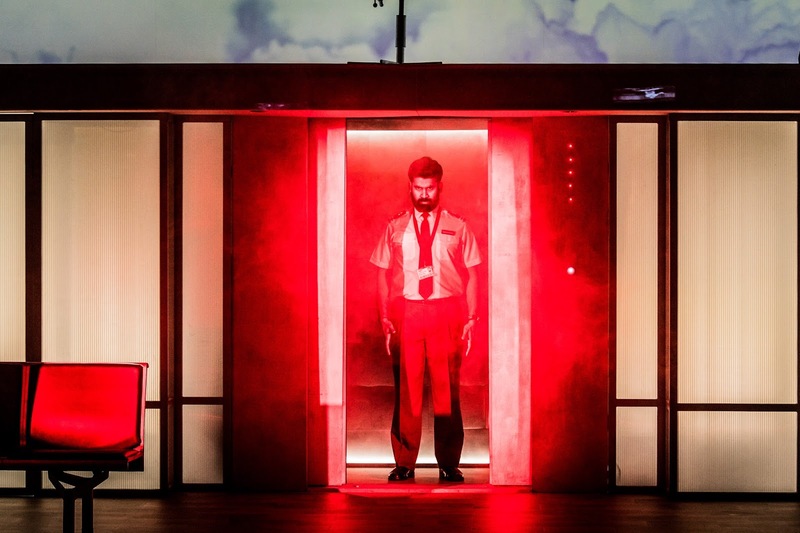 I have to confess that I would prefer the opera performed with a greater sense of human frailty and less emphasis on comedy, but the cast was uniformly excellent in the way they created Martin Duncan's vision. 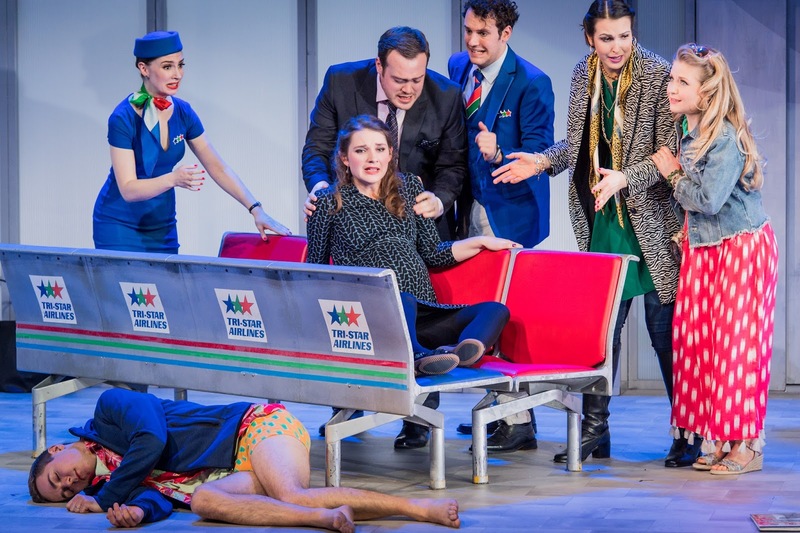 Comedy is difficult, and the entire cast managed to carry us away with engaging good humour. Diction was good so that the surtitles were hardly needed especially as the new theatre's acoustics are excellent and I hope that Royal Academy Opera experiments with dropping surtitles in future. In the pit, Gareth Hancock drew an engaging performance from the Royal Academy Sinfonia, they clearly enjoyed Jonathan Dove's instrumental textures and managed to imbue their performance with a sense of engagement and vibrancy.